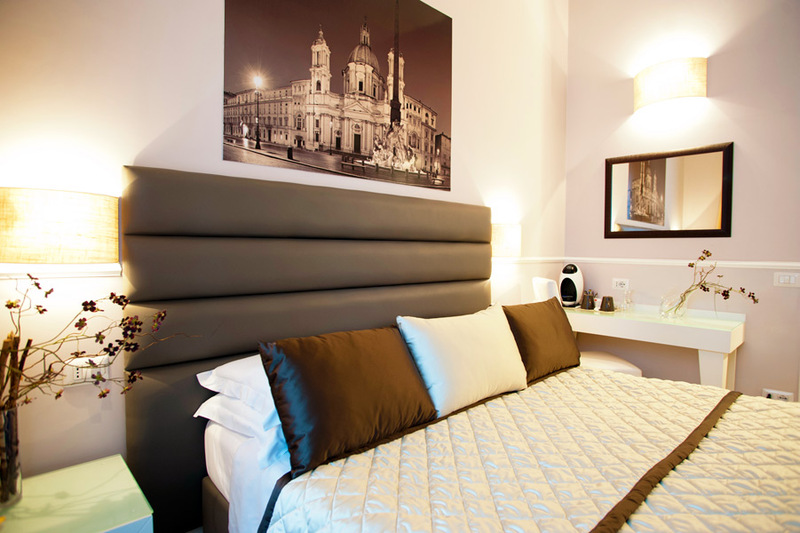 Our Standard Bedrooms offer comfortable space and a relaxing atmosphere. 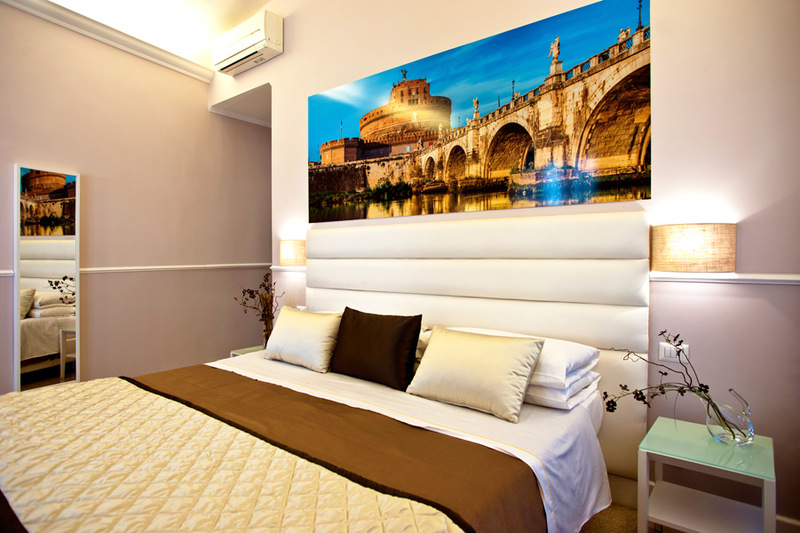 All guestrooms are extremely spacious and with an excellent external view that provides plenty of natural light. 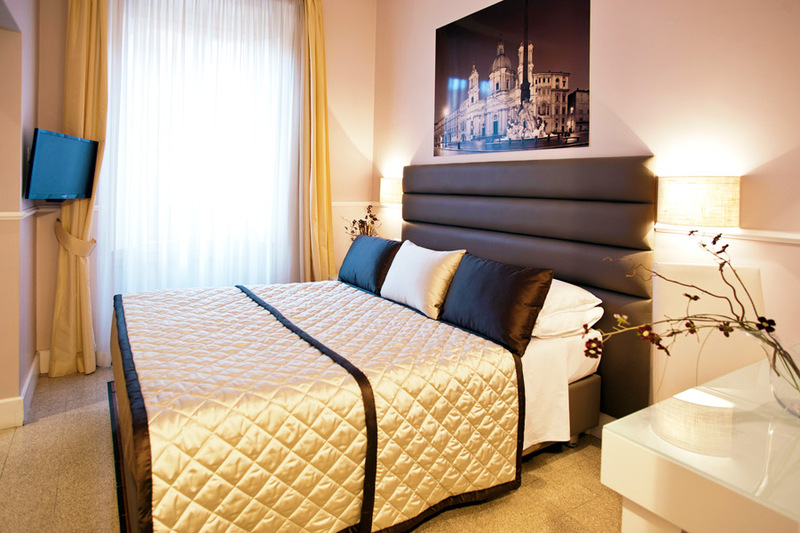 Comfort is of high standard with king-size bed and double set of pillows. 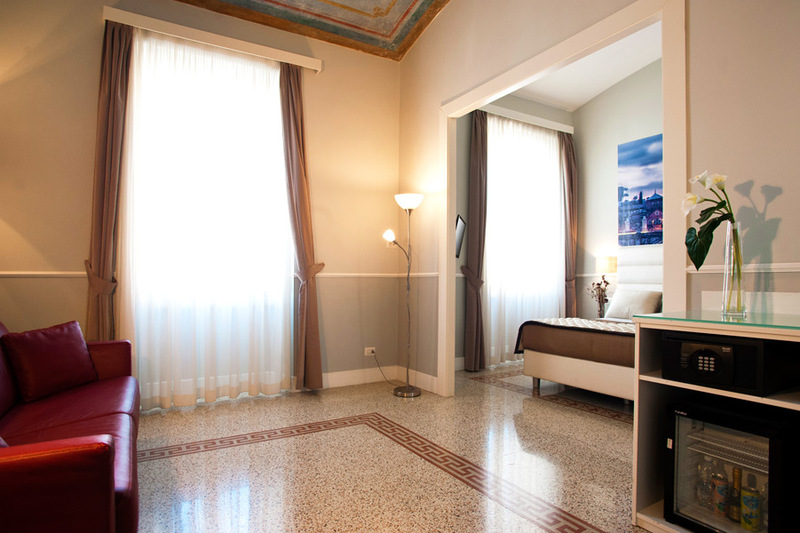 Marble grit flooring have been renovated and restored according to the original designs of the 17th century period. 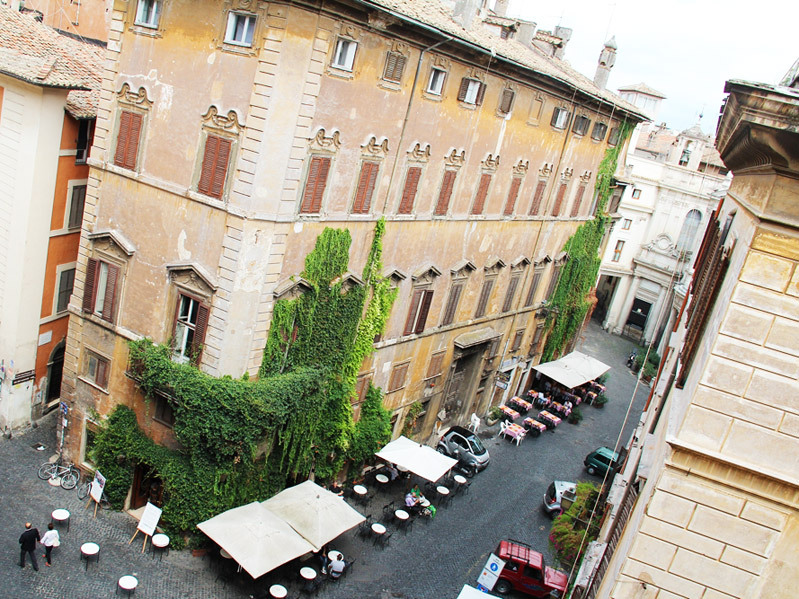 Windows are large and soundproof. 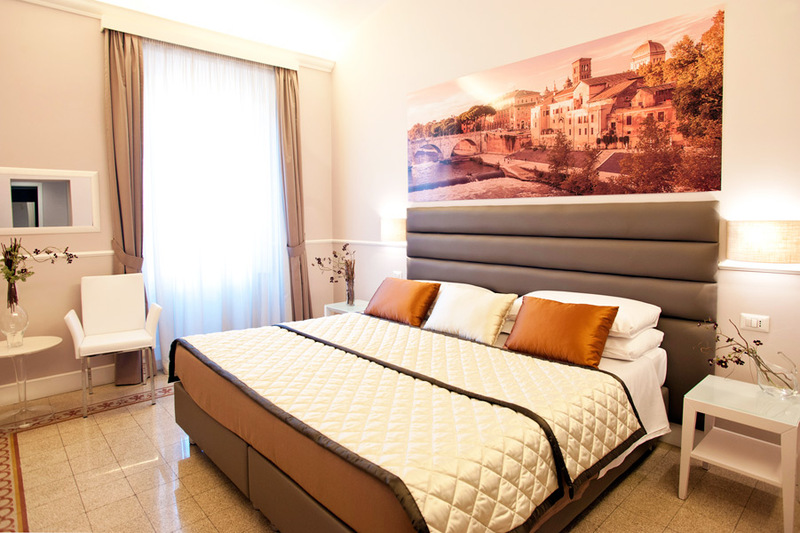 Standard guestrooms are suitable also as twin bedrooms and are all equipped with climatisation, digital safe, minibar, big LED TV, a large closet, and a comfortable desk with coffee&tea amenities. 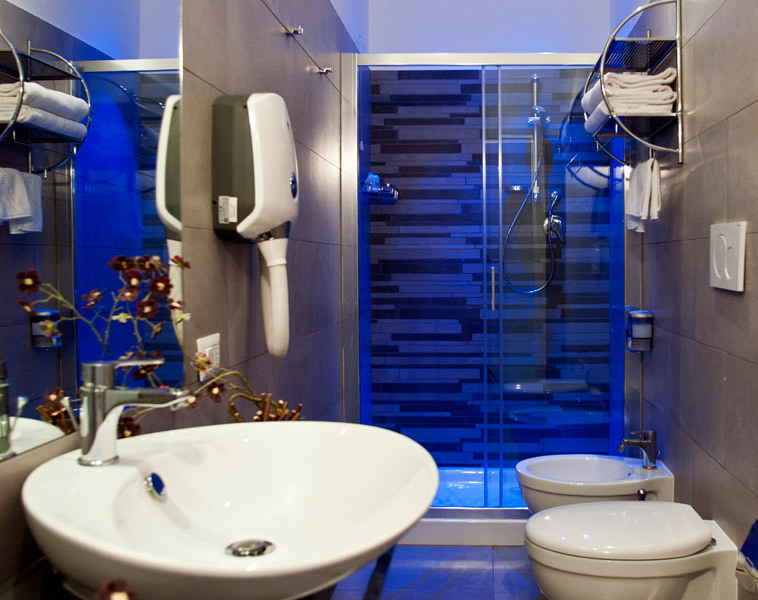 The bathroom is cosy, large and functional featuring a large shower with blue lights for your indulgence and is completed with a bidet, a hairdryer, hospitality kit and a full set of towels. 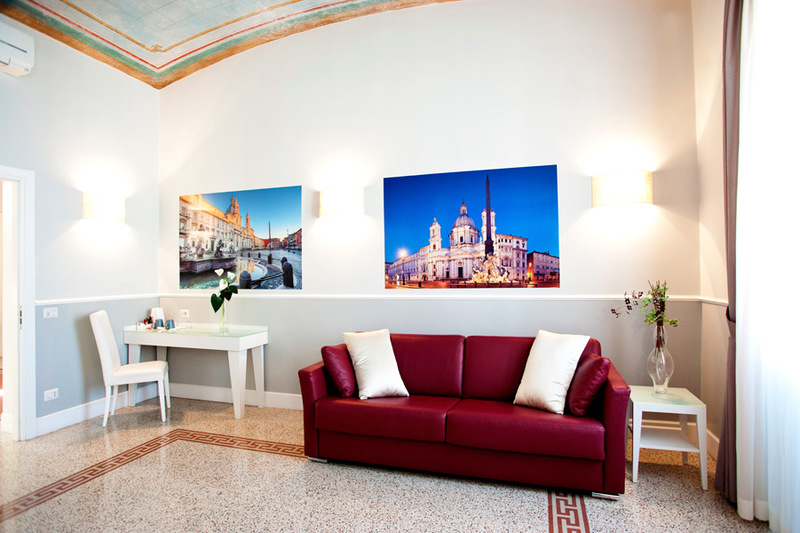 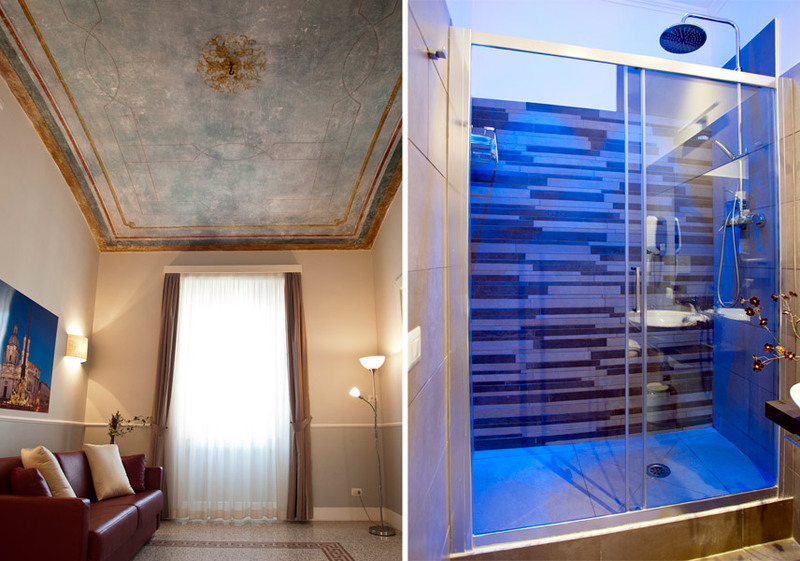 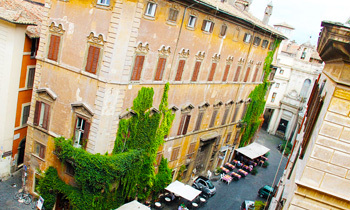 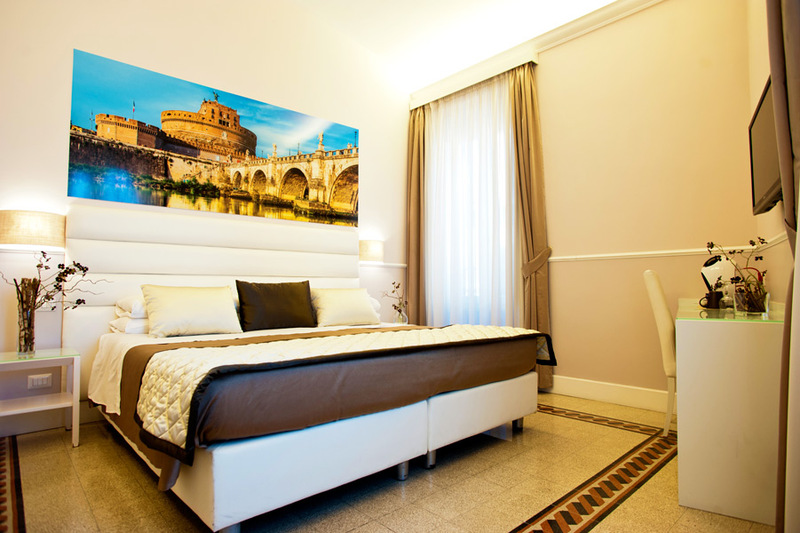 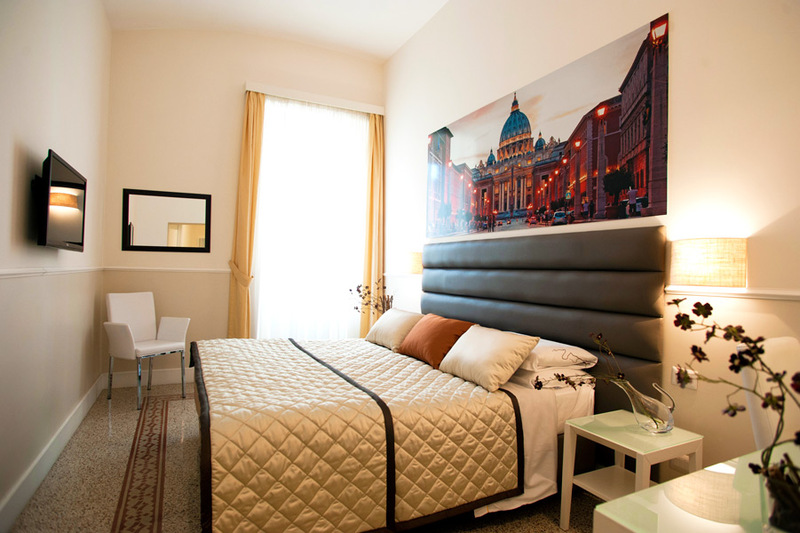 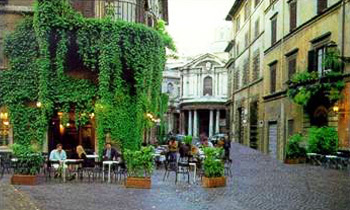 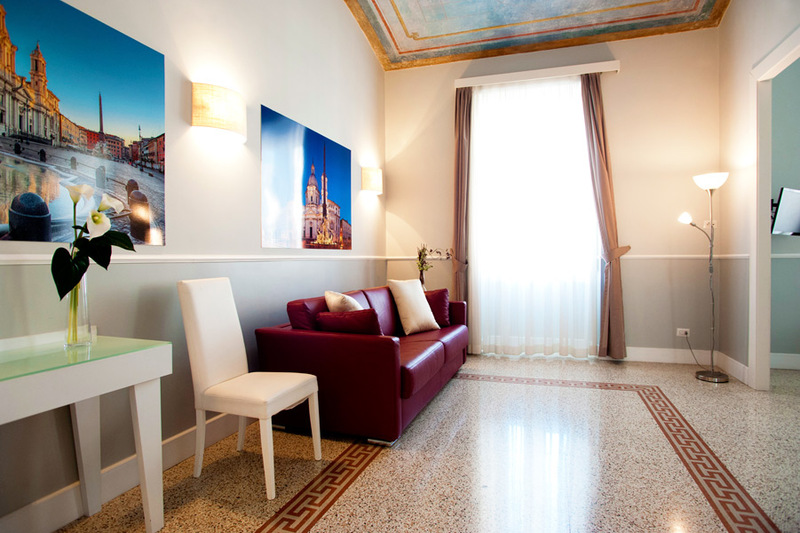 The B&B Rooms in Navona wants to please all its guests with a special stay at an affordable price. 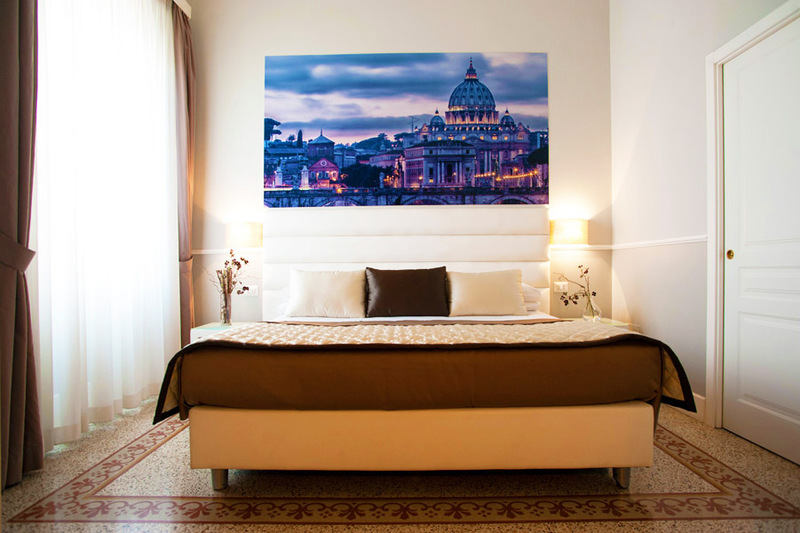 The room with a view has an enviable position with two large windows is positioned at the angle of the the palace, from the main window you will enjoy the view of the Chiostro del Bramante, the Pace Square and the Antico Caffè della Pace, a symbol of the historic center of Rome! 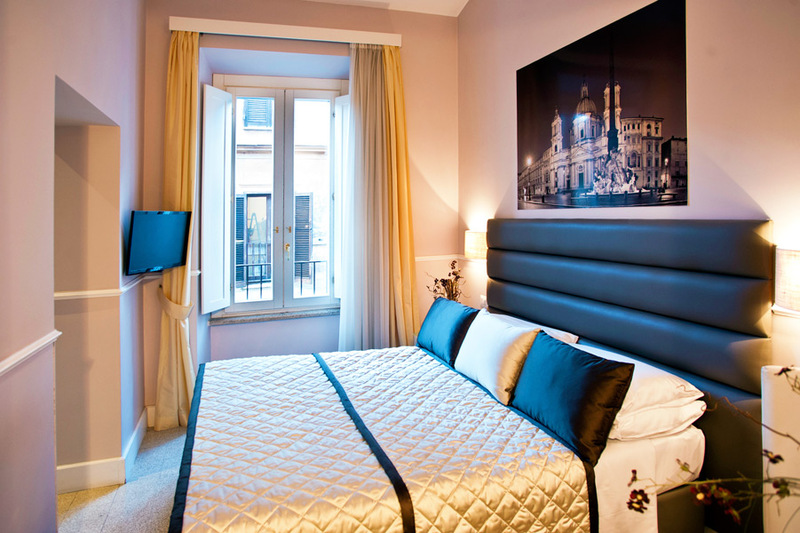 The room consists of a king-size bed which converts into two single beds on request of customers. 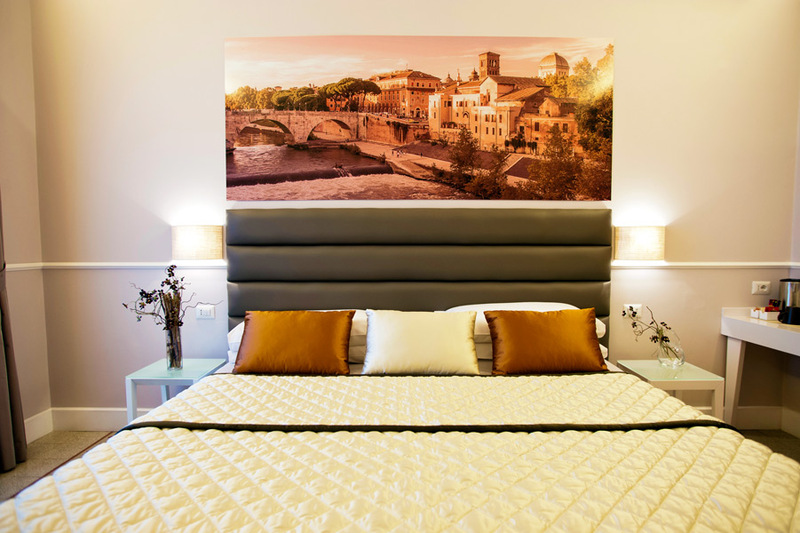 The headboard is made of soft ivory faux-leather. 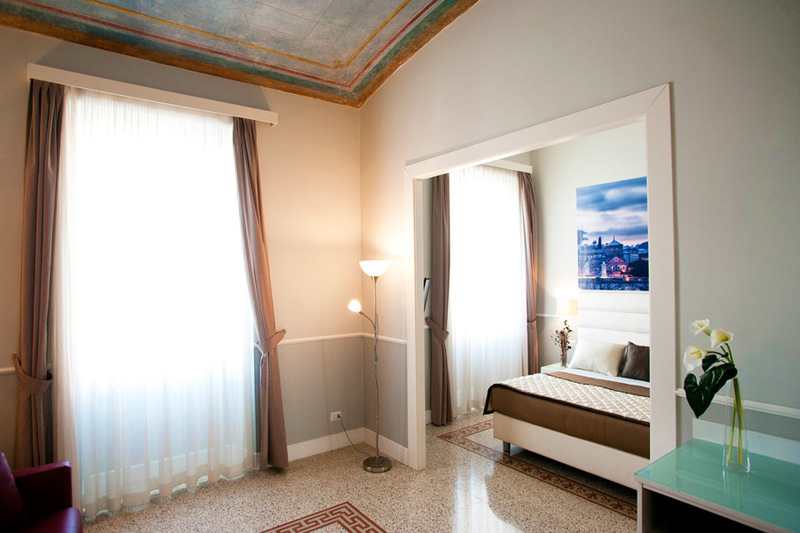 The closet is in view with a wood frame decoration restored from the original 17th century furniture, the floor is decorated with the original grit of the period. 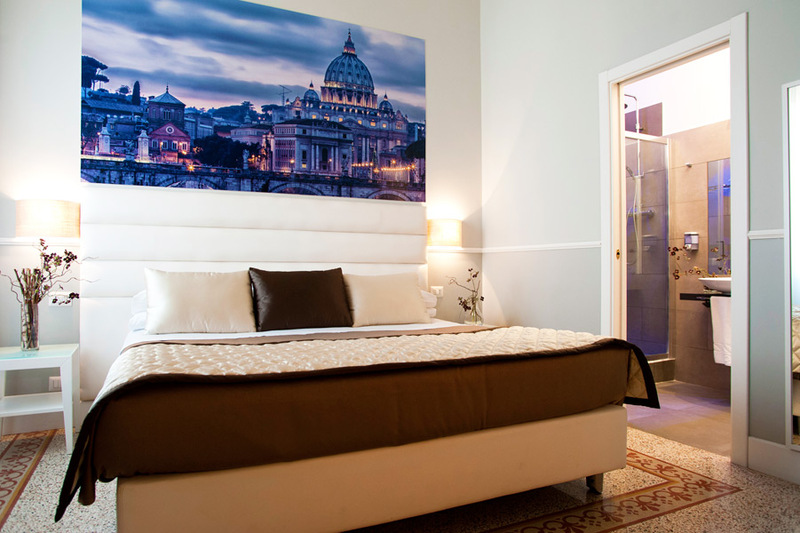 The guestroom is furnished with a desk in lacquered wood, white leather chair, two bedside tables, folding luggage rack, coffee & tea amenities with plenty of selection. 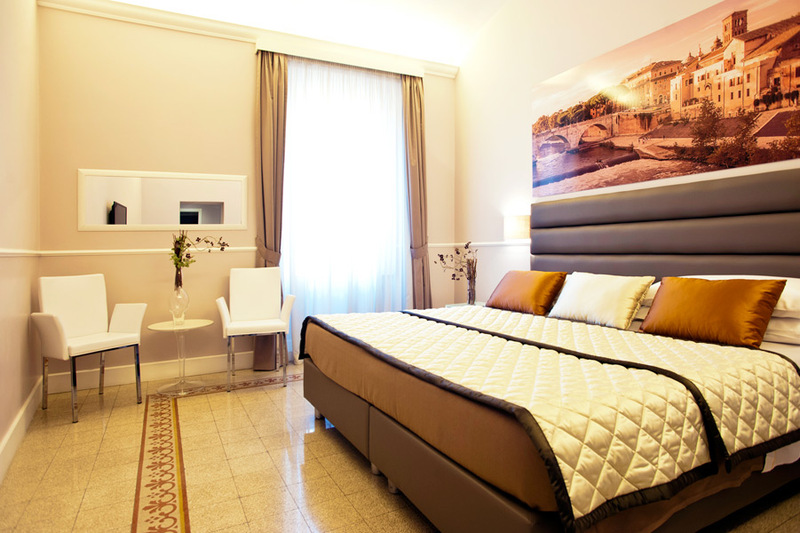 It has a digital safe, a minibar, climatization, 32’flat screen LED TV a private bathroom with large shower, bidet, hairdryer, complimentary toiletries & full set of towels. 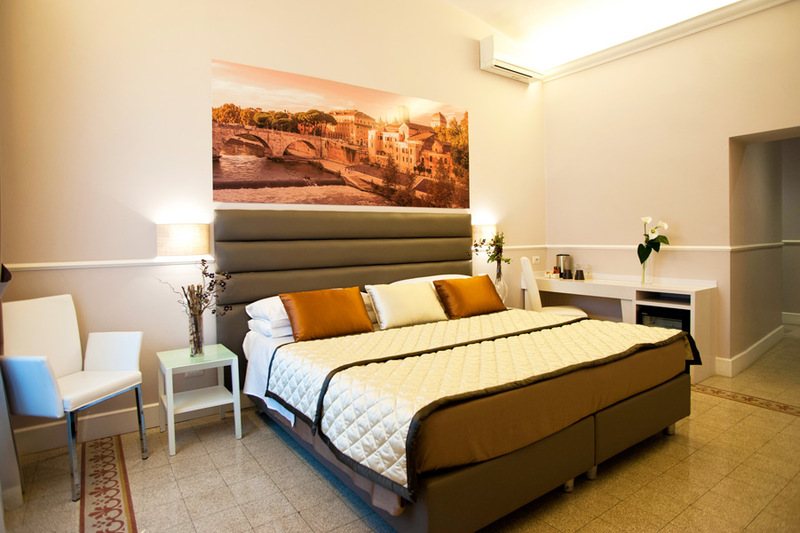 The Superior Double room is a double room with private bathroom and provides ample space for about 25 square meters and make customers feel even more at home, it also has a table and two chairs. 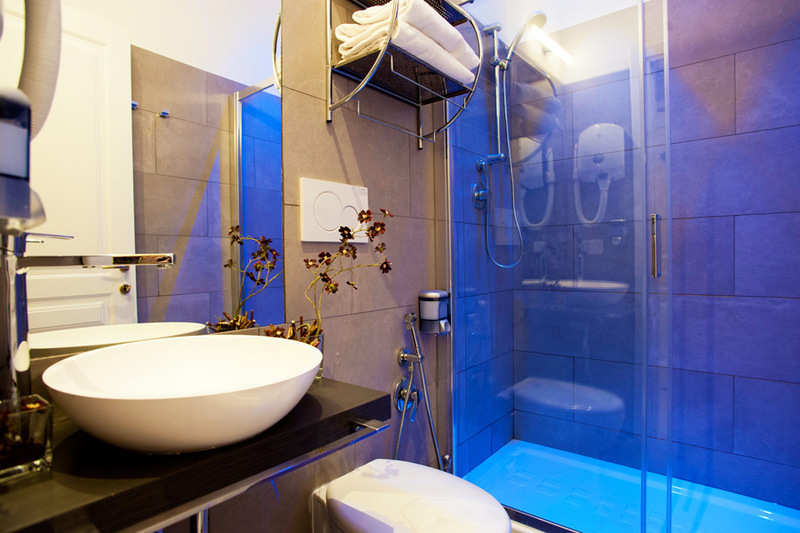 It enjoys a good exterior facing offering plenty of natural light. 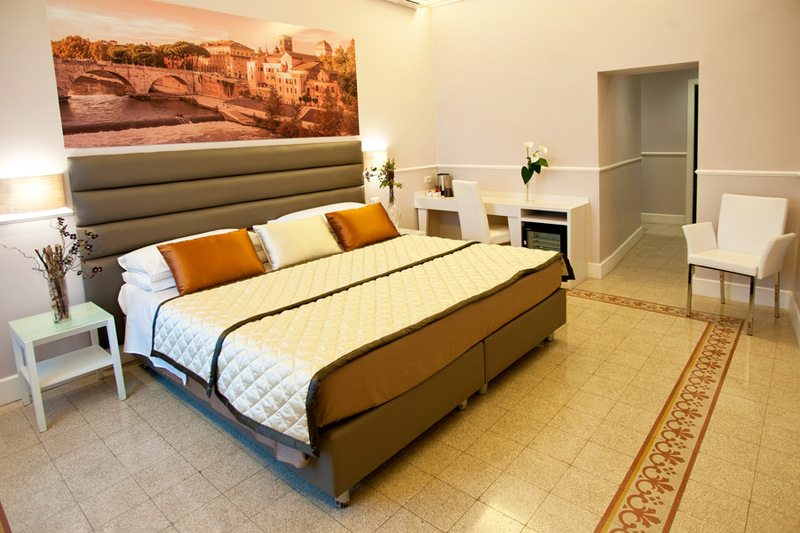 Comfort is of a high standard with king-size bed (which when required can be divided to create two single beds) and double pillows. 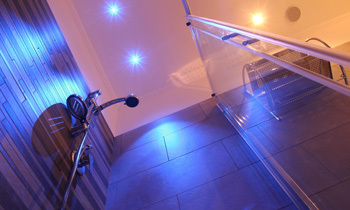 The floors have been renovated and restored following the ancient decorations of the 600 grit polished. 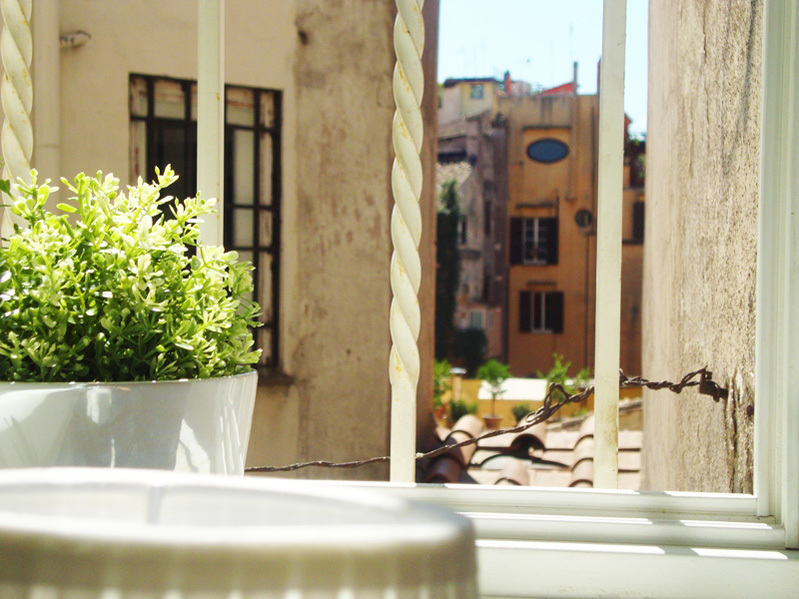 The window is soundproofed with double glazing silence model. 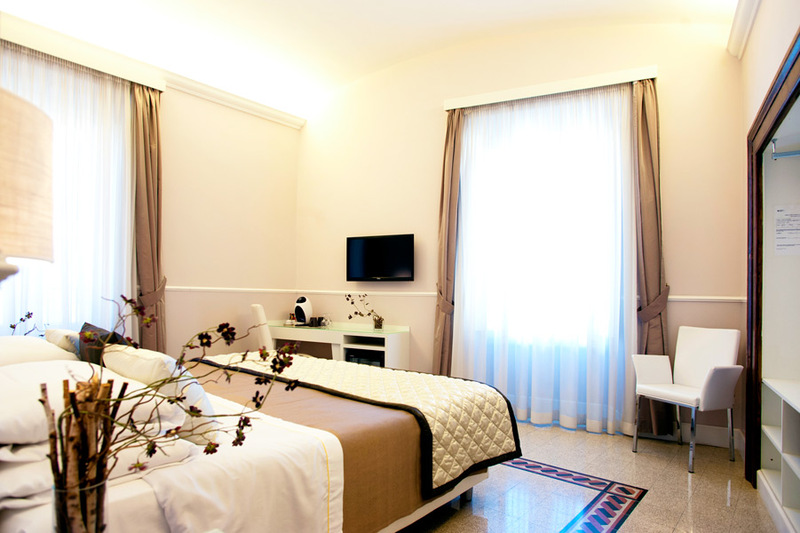 The room is equipped with air conditioning, digital safe, minibar, TV LED 32 ‘, open closet, desk and chair, coffee & Tea corner with a wide selection of teas. 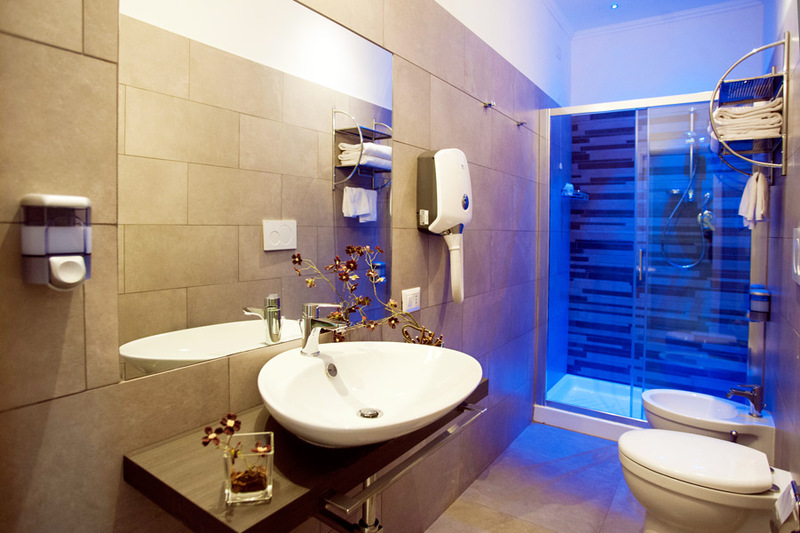 The bathroom is comfortable, large and functional: it has large shower with light blue effect Relax and comes complete with bidet, hairdryer, hospitality kit, complete set of towels. 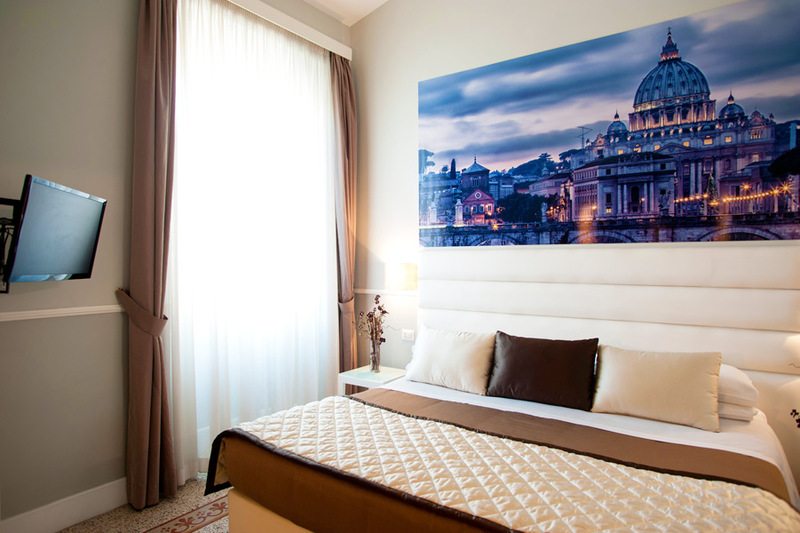 The Suite Bramante is an exclusive family room, elegantly furnished with soft colours, designed for a special couple or an unforgettable holiday with your family: it can comfortably accommodate up to 4 people. 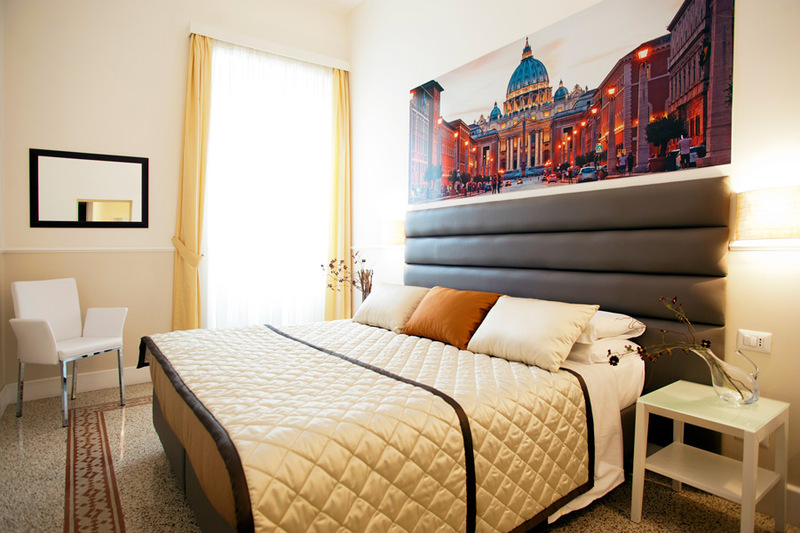 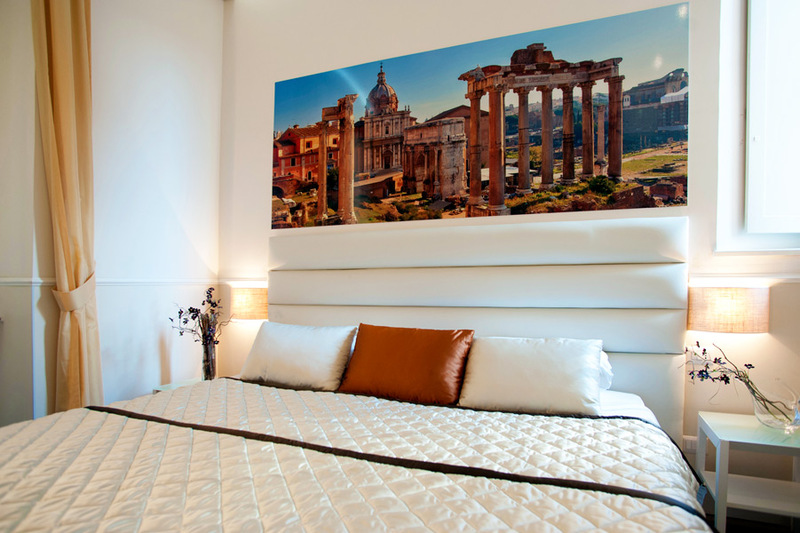 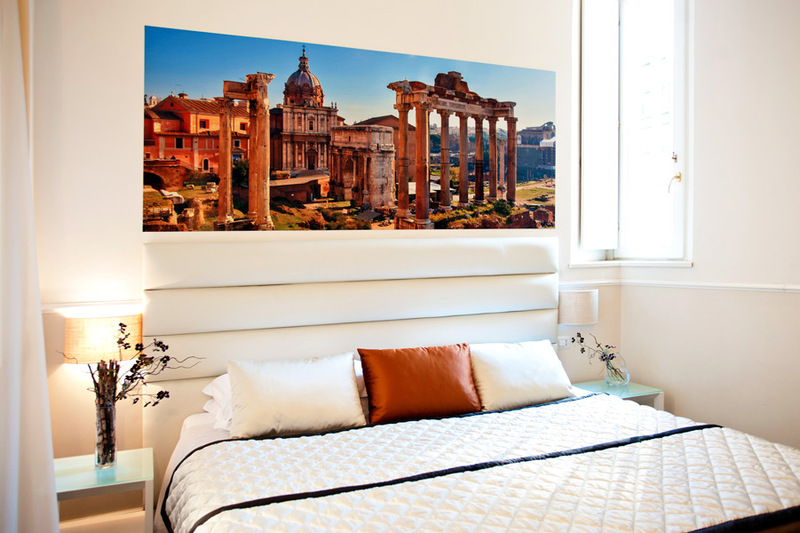 This boutique apartment offers a comfortable and bright environment with a privileged view facing the Chiostro del Bramante and a stunning overview of the famous rooftops of Rome. 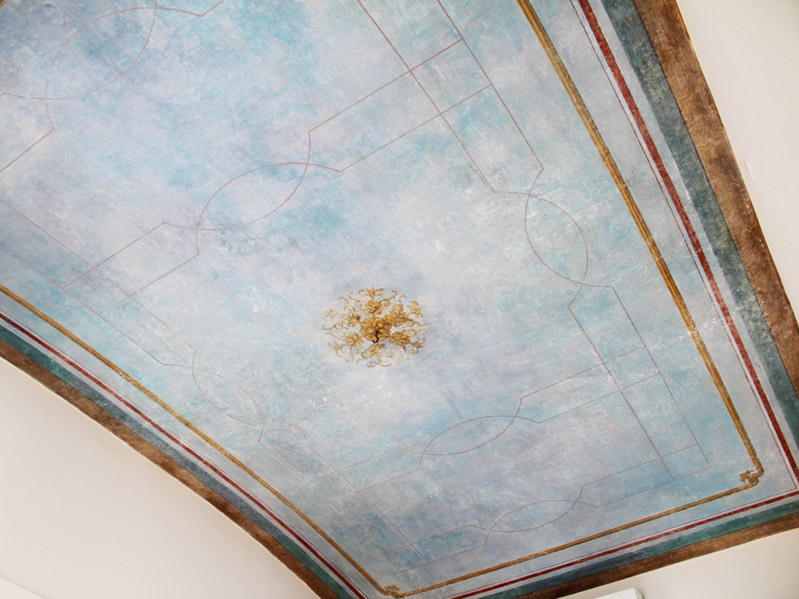 Then lift up your nose and you may admire a fascinating view of an original fresco from the XVII century that characterizes the atmosphere of the room. 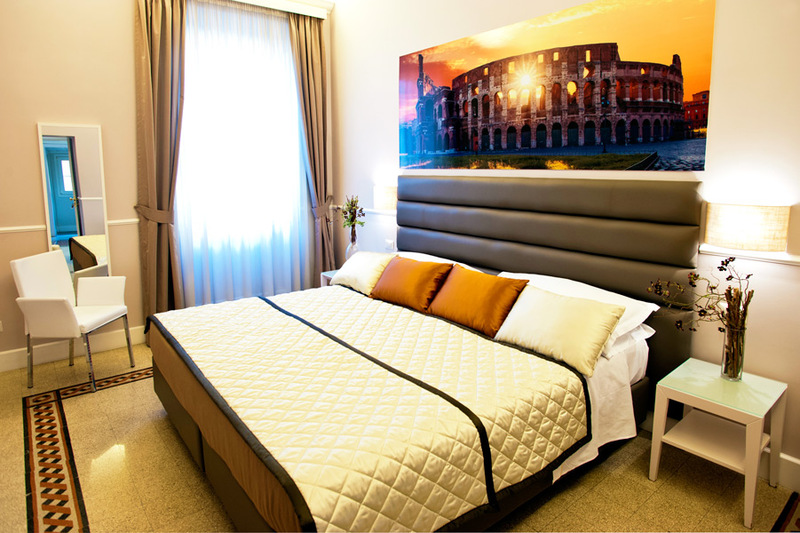 The suite has a large walk-in closet and the living room is spacious and fully furnished with an elegant desk and chair in faux leather, a cozy leather sofa bed, folding luggage rack, digital safe, minibar, individual climatisation and a large 32 ‘LED TV. 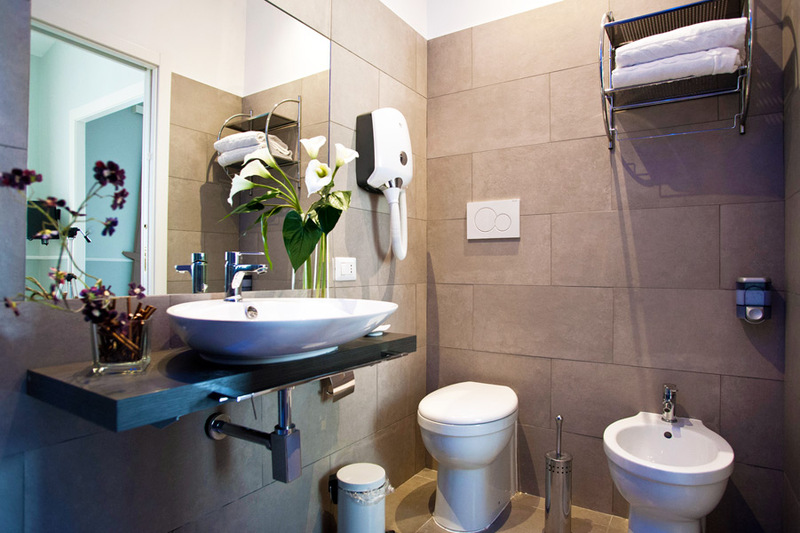 The bathroom is private and comfortable and equipped with a large luxurious shower with crystal doors, bidet, hairdryer, complimentary toiletries and a complete set of towels. 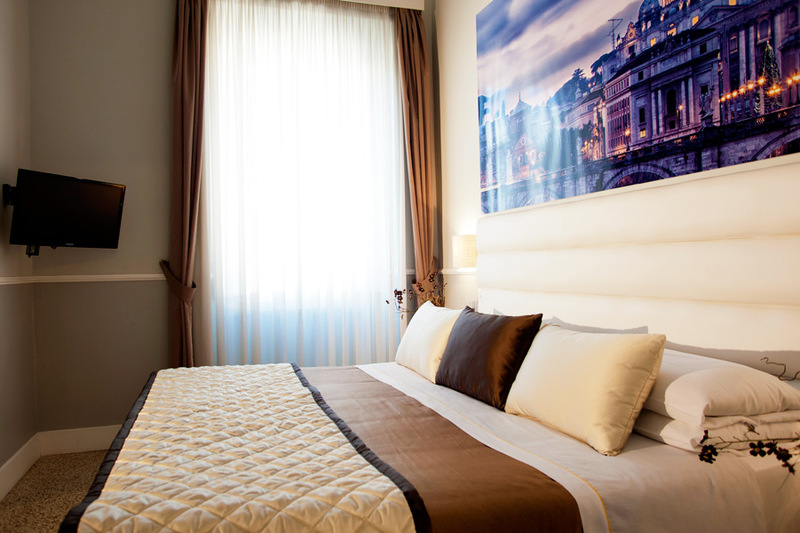 Plenty of room to better enjoy your stay.